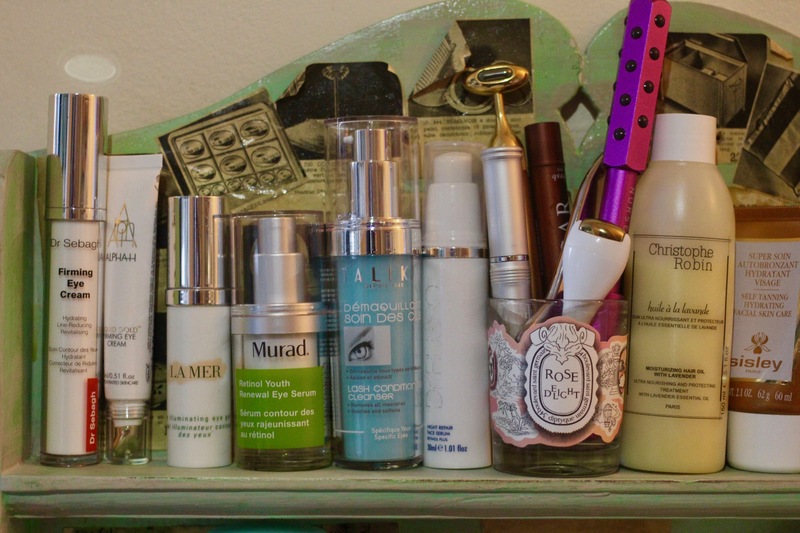 Until last month, I was feeling a little bit jaded about skincare. Yes, I was testing all the big new launches and innovations and having some success with them, but the change I wanted to see in my acneic, scarred skin wasn’t happening, and I was quite frankly bored of people promising me perfect skin if I just used their lotions and potions. I suspect you feel the same; most brands promise extraordinary things, and many facialists the skin of a newborn if you just do this/use that, and I am often cornered at parties and dinners to discuss skincare, with both men and women telling me that they’ve spent enormous amounts of money in the pursuit of better skin, only to be disappointed. I want to be very clear here. 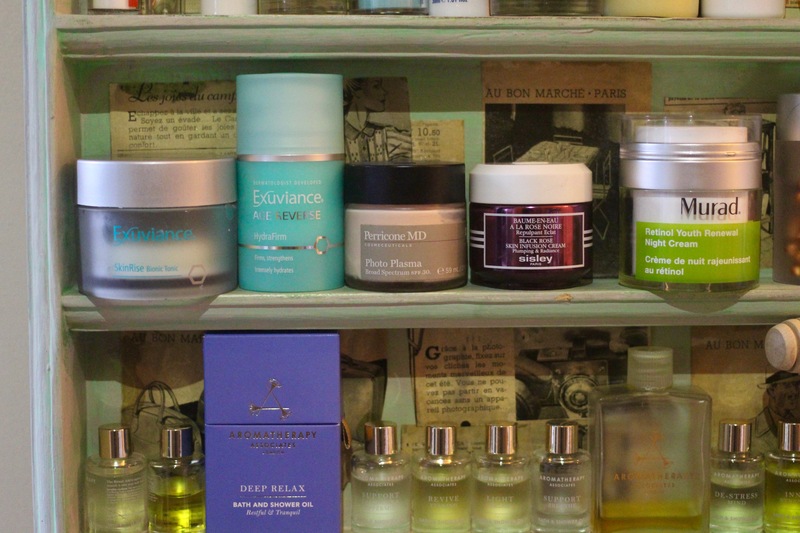 Skincare is NEVER the whole story. What you eat, how much you sleep, the make-up of your genetics, and even how hygienic you are will affect your skin. What you put on it will, too – but if you’re getting the other stuff wrong, no serum can give you the skin of Jessica Alba. Equally, if you live a relatively healthy life, using the right products for your skin that are geared towards reducing inflammation and are designed to protect it from further damage will lend your skin time to do its thing – namely, to heal, to turn over, to balance its own delicate ecosystem – and giving it that opportunity really does reap enormous benefits. In my view, the best skincare will support your skin, much as a good diet gives your body the nutrients it needs to function. And that’s why Pam Marshall is the best discovery I’ve made in bloody ages. During a session with her at Mortar & Milk, she talked me through my skin’s behaviour in minute detail. She asked if I cleaned my pillows (not the cases – the ACTUAL pillows, because not cleaning them can feed your skin fungus and bacteria nightly, propping up acne). She asked if I cleaned my phone, wore make-up when I exercised, how I cleansed. Then she took pictures of my skin in lights designed to show pigmentation, redness and myriad other indicators of underlying damage. And then she gave me a very comprehensive facial. Post, my skin looked calm, plump and clear – in my view, the marker of a good facial (provided lasers aren’t used, in which case you can expect downtime and redness). What happened next was extraordinary – and accounts for my sitting down to write on a Sunday evening. 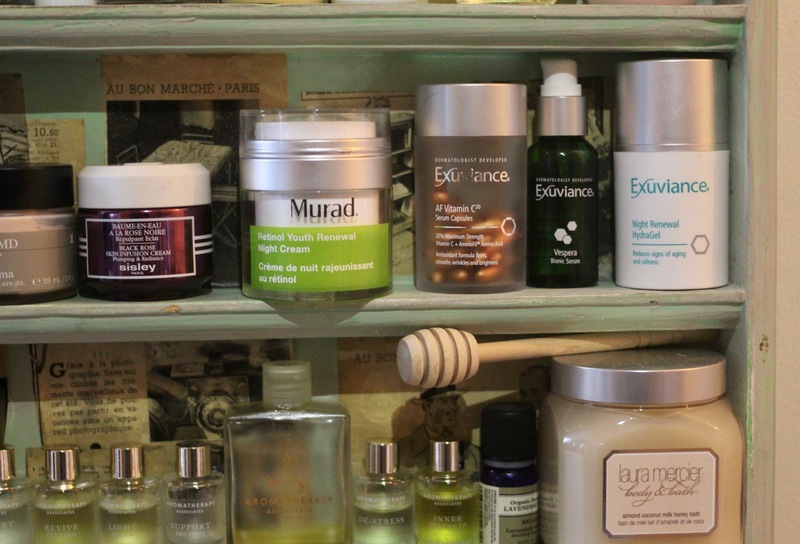 Pam had mentioned that my skin would get better over the course of a week when using the Exuviance products she recommended to me. She’d said polyhydroxy acids would help to exfoliate but also to bind moisture to my skin and thereby treat my acne and my dehydration. But I sort of didn’t believe her (see above). Only she was right. I stripped my routine back to the bare minimum, using only those she recommended. That was over a month ago, and my skin is the best it’s been for around 10 years, when I was doing daily yoga to reduce my stress and eating mostly vegetables (I was an odd student). That said, I’ve still had the odd spot and of course my scars haven’t magically disappeared – but my skin isn’t anywhere near as reactive or quick to get angry. I don’t want to suggest that you use this routine, though I will quickly run through it to let you know what each element does and how it’s working for me. Rather than blindly buy new products, what I’d really like you to do if you’re having troubles with your skin and just can’t get to the root of it, is to book in to see Pam. She won’t promise you the earth – she’ll just combine her immense knowledge of how skin works with good sense, great products and an understanding of how crippling having skin that isn’t how you’d like it to be is. 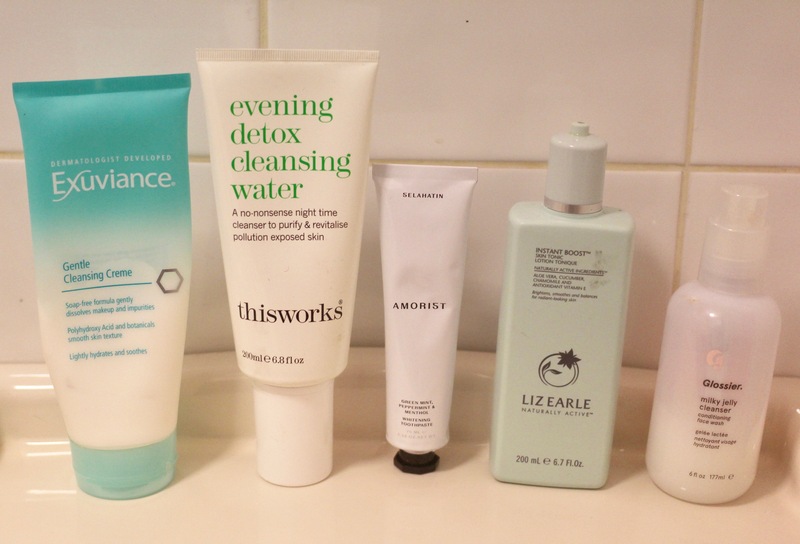 Cleansing / Eye make-up comes off with the This Works Evening Detox Cleansing Water on a cotton pad (which I then sweep over my face), other make-up with Glossier Milky Jelly Cleanser. Both are gentle and remove make-up speedily but without irritating my skin. I clean my skin, so to speak, with the Exuviance Gentle Cleansing Cream and it’s brilliant – gentle, cosseting, never leaves skin red. Pam says it’s full of PHAs, so it starts the treatment process. I’m a fan of toner, despite knowing it does little to skin, so use Liz Earle’s Instant Boost Skin Tonic to finish the process, as my skin’s always liked it. Day / This routine is simple and is designed to protect and lock in hydration. After cleansing with the Exuviance cleanser, I take an Exuviance SkinRise Biotic Tonic pad and wipe it over my face and neck, before chasing it with Exuviance HydraFirm to tuck the moisture in and apply an eye cream (I have a few on the go). I leave that for about ten minutes while I dress/brush my teeth/play with Monty, and then apply Perricone MD Photo Plasma. Night / This is where things get a bit more confusing, as I now do some micro needling and a bit of retinol, too. But to give you a rough idea, I essentially do something to ‘disrupt’ my skin every other night, triggering the healing process or giving it a big dose of goodness. Mostly, this is Vitamin C (I use those Exuviance AF Vitamin C Serum Capsules). Next, I use the Exuviance Vespera Serum, followed by the Exuviance Night Renewal Hydrogel. Disclaimer: this post isn’t sponsored, but some of the links are affiliate. Exuviance kindly sent me the products, which is a standard process as a beauty journalist and by no means guarantees coverage. I definitely agree that less is more. It also costs less to use a few products. Exactly! It has made such a huge difference to my skin.